British Columbia's Finance Minister Mike de Jong speaks in the BC Legislature in Victoria on July 25, 2016. Photo by The Canadian Press. The British Columbia government will support the city of Vancouver's request for a tax on vacant housing, but questions remain about who will pay the costs of enforcement. 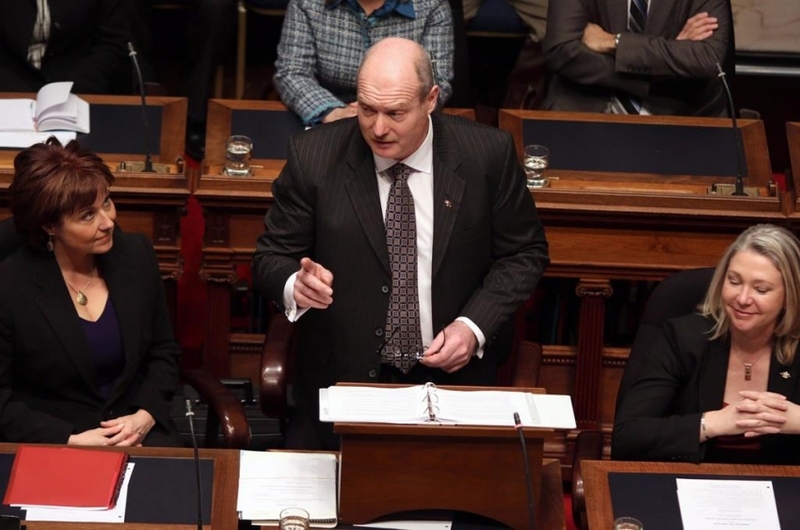 Finance Minister Mike de Jong has announced the legislature will meet July 25 to consider revisions to the Vancouver Charter that would allow the city to create and collect the tax. De Jong said the levy is aimed at improving the supply of rental homes in the city's superheated real estate market, while waiting for new construction to come online. "There's no question that, in addition to the conversations that we have been having about affordability with respect to the purchasing market, there are challenges for folks wanting to rent," he said at a news conference Monday. "It is ultimately about supply. It is about trying to increase the supply of rental accommodation." Mayor Gregor Robertson and de Jong met two weeks ago to discuss the city's demand for a tax. At the time, the mayor said if the province wouldn't help, the city would create the levy on its own using existing, but unwieldy mechanisms in the charter. The finance minister said Monday that the province would share data, including electricity usage and information it gathers through a homeowners' grant to help the city identify vacant homes and enforce the tax. De Jong said the city would be responsible for day-to-day administration, but Robertson said at a separate news conference that those details hadn't been worked out yet. "We haven't gotten to the point where we've made decisions around how this is going to be administered," Robertson said. He said city and provincial staff will continue to work together and consult with the public and stakeholders to design how the tax works. The city is hoping for a "co-operative arrangement," with a tax in place by next year, he said. A recent city-commissioned study found that about 10,800 homes were left empty for a year or more, most of them condominiums. The city's rental vacancy rate is 0.6 per cent. Robertson said it was too early to say how much owners of vacant homes would be taxed. He acknowledged some are so rich that a tax won't be a strong enough incentive to rent out their units. "If people are wealthy enough to hold these houses empty 12 months of the year, then they should be paying a higher tax," he said. "That money can be used for affordable housing." The tax wouldn't target snowbirds or part-time residents, only people who are keeping homes vacant year-round, he added. NDP Housing critic David Eby said the province has the tools to levy taxes on people who are using housing as an investment instead of a place to live, but it has refused to do so. "The action they're allegedly taking is, as always, the absolute least that they could do," he said. "They're asking the city of Vancouver to do (the province's) job of protecting the interests of Metro Vancouver residents who can't afford to buy a place, simply because they're unwilling to do it themselves." Eby said he will have to see what de Jong puts forward in the legislature before he decides whether to support it. The province is also set to introduce legislative changes to end self-regulation of the real estate industry, fulfilling a promise Premier Christy Clark made last month after a damning report concluded Realtors had lost the public trust.